A new waterpark is on the drawing table for hotel guests staying at the Opryland hotel! 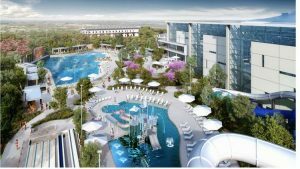 Ryman Hospitality Properties Inc., formerly Gaylord Entertainment, has planned for a three-story water attraction that would include slides, lazy rivers, and adult/children’s pools for their guests to enjoy. While this may be a guest-only attraction, the water park is sure to increase bookings, with tourists and natives alike, when it opens. An inspection is scheduled for Feb. 27, with a public announcement due in late January. Read more here.